you have some experience I would head straight there. change the background while you're at it. I suggest you open all of these into new tabs before you begin the tutorial. That way I can use screen shots! large white part at the bottom which doesn't blend into my black background or pictures' background at all. Lets see how we can change this. 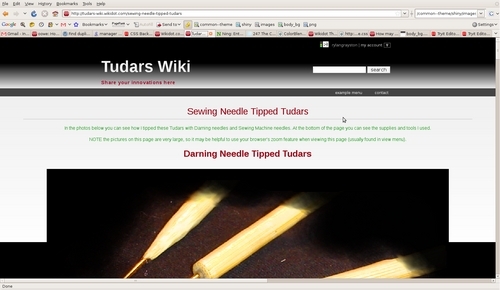 While at the page in question click, ( from your browser's menu) View and then Source. This will show a page with the code for your site. 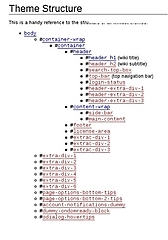 In the code you can see where the CSS is coming from. go ahead and click the link above you will see a page with the CSS for the shiny theme. Of course if you are using a different theme you will find a different URL in the source code of your site. Now in the CSS theme code look for the part that sets the background image. the CSS themes check out this interactive page. Its like only 3 pixels wide! It might be easier to see if you click and drag to highlight it. This is very useful because we are only looking to change the big white part at the bottom. The gradient and grey bar are part of why I chose the shiny theme. So by saving that image to your hard drive with a right click, "Save image as"
you can open it up with your favorite image editor (The Gimp) and take off the white bottom. 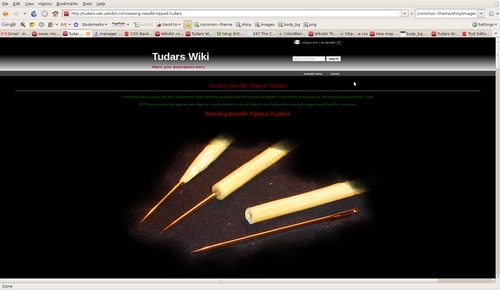 then go to your wiki css page, click files at the bottom and upload that new file. But only if the file displayed on the page! but hopefully you clicked all the links and learned your way around wikidot.